I believe, it has been two years since we have had news coverage in a local news paper. 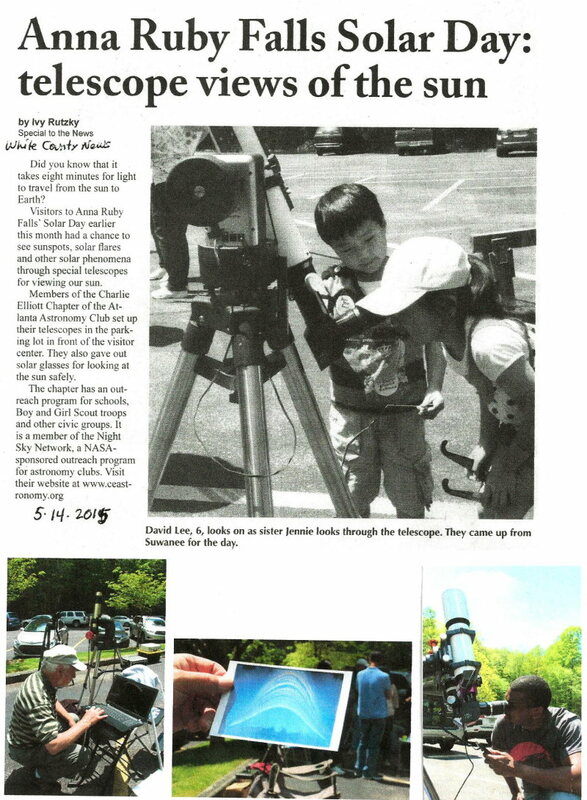 This year the White County News ran an article about our Solar outreach at Anna Ruby Falls. This event is every year a success and the management at Anna Ruby Falls love us to come out there year after year. Below an image of the newspaper clip of the article written by Ivy Rutzky as well as some of the pictures she took. Please respect the ownership of the images by Ivy. Thanks to all that did participate in this event and to Ivy to give us again some more exposure! Please click the thumbnail below to read the article. Three of us, Bob Jacoby, Frank Garner and Theo Ramakers went to McConnell Middle for this year’s Astronomy Day for some of the 6th grade classes. Three classes of Mrs. Sandidge, and two of Mr. Yoder, learned what effect traveling through the Solar System has on gravity. In addition, they learned some interesting facts about some of the planets. Then it went outside to observe the Sun through a number of Ha Scopes and White Light telescopes. They all were very surprised to see the activity on the Sun and went home having a better understanding of our Solar System. Yesterday we did participate in CEWC’s event for Kate’s Club of Atlanta at Panola Mountain State Park where we brought a Solar event to about 68 kids and their chaperones. The weather changed its mind and turned out gorgeous, so they got to see the Sun with some nice features and got to search for our model Earth through a scope in our relative size/distance activity. They also learned what UV rays do to us, by looking at our UV beads and learned where the energy comes from on Earth. Thanks to David, Dan T, Dan S, Jon, Frank and Theo for participating. Click on the image to see the gallery. Friday night we had a great outreach event for Grayson Elementary School. We had four club members come out to brave the wind and cold to show eighty 2nd grade students some night sky objects. 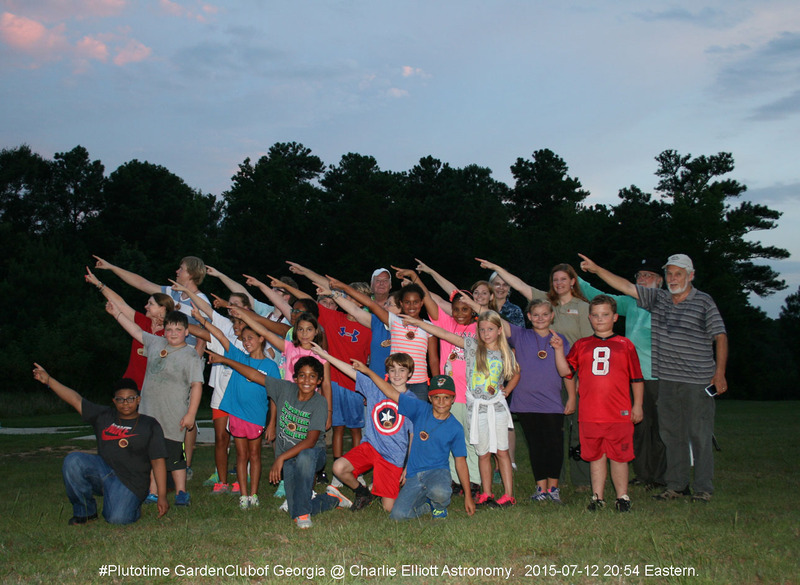 The kids and teachers were able to see Jupiter, Jupiter’s moons, Venus, M42 and a gorgeous 1st quarter moon. These students were perfect ladies and gentlemen for the whole night. It was a true pleasure to work with them. 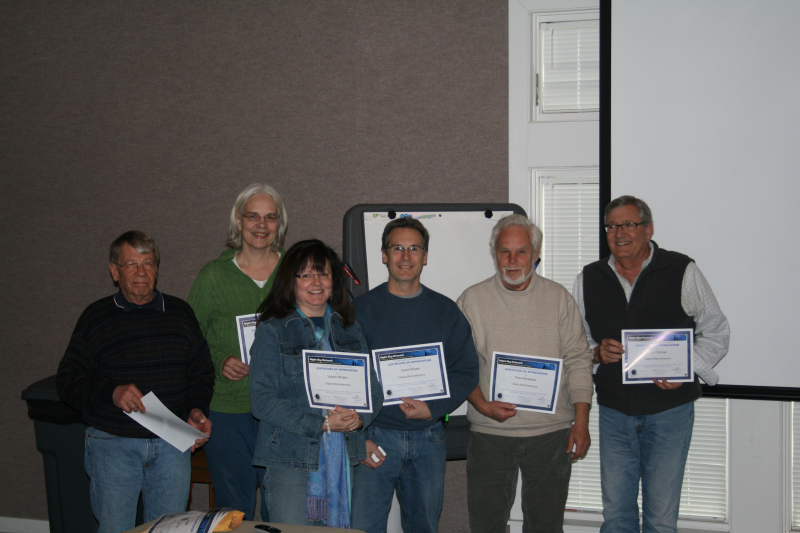 At the February meeting, we gave out the awards for members who volunteered time in 2014 for outreach. Members who participated in less than 5 events during the year were listed in our presentation. Those members who participated in 5 or more events were given certificates and a pin of appreciation from the Night Sky Network. If you were unable to attend the meeting, you can view the presentation through this link. Thanks again to all those members who graciously donated their time and talents. We are off to a great start for 2015, and welcome anyone who is willing to help out. If you are not registered on the Night Sky Network website, but would like to be, please register at this URL. All of the upcoming outreach events are listed on our calendar here.